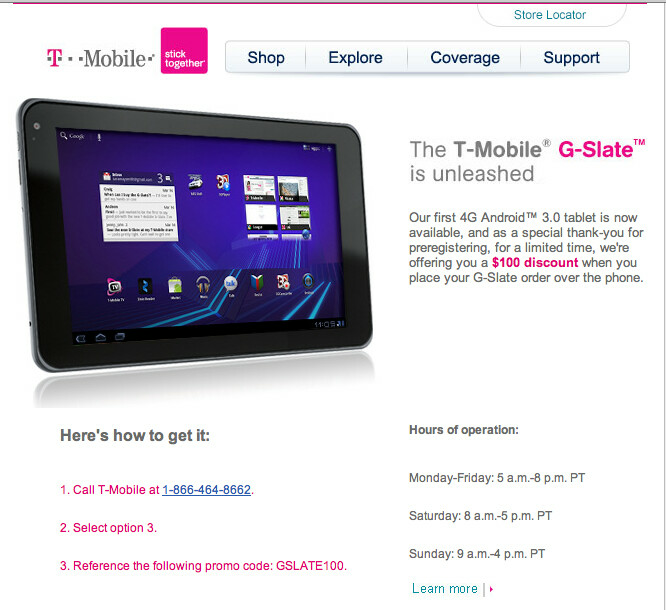 How would you like to get a $100 discount on the T-Mobile G-Slate? The carrier is offering the price break to those who order the Honeycomb flavored tablet before April 27th. All you need to do is follow some simple steps. You must order the G-Slate by telephone before April 27th. The number to call is 1-866-464-8662. Select option 3. Reference the following code: GSLATE100. That's all there is to it. The number will be operational Monday through Friday from 5am-8pm PT, Saturday from 8am-5pm PT and Sunday from 9am-4pm PT. Now, there is one little caveat. This offer was originally created to be sent out only to those who signed up for more information on the LG-manufactured tablet on T-Mobile's web site. But things being what they are these days, the offer has been spread around various forums, Twitter, Facebook and other social networking sites. Now that the discount has been made public,well, there is no penalty for giving it a try anyway if you have been planning on ordering the G-Slate. 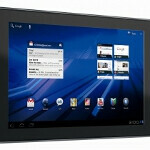 The tablet costs $529.99 with a new 2-year contract before the discount. If you were able to get the $100 discount, share your good fortune with us by letting us know; simply fill out one of the comment boxes below. Why would anyone want to wait about a week to order and receive a G-Slate when they could go to their local store and get one today?